I have noticed that conservation work in tribal India is most difficult in well-forested areas. When people have good forests, from which they can procure food, construction material, medicine and ingredients for fashioning their articles of utility (baskets, mats and traps), they would want little else, especially from the state or the non-state organisations that tend to worry about them or the protection of their forests. Much of this tribal indifference, which really is independence, to the various schemes inflicted upon them stems from the fact that they are able to find sufficient food in their forests. One often hears a forest guard or a road contractor complain that it is very difficult to get labour in tribal areas, where villages are full of people but nobody wants to work. They usually say, “The tribals have nothing to do, but they will not come and earn some money.” When one has a guaranteed source of tasty and high-quality food, for free, why would one wish to go and break stones by the roadside and be shouted at? One way of categorising wild foods gathered for subsistence is through their importance for people’s survival. Some are exclusively famine foods (leaves of celosia and bidens, usually regarded as weeds), some are seasonal (bamboo shoots during monsoon), some are occasional (bamboo seeds during the periodic flowering), some are collected routinely as a staple (various yams and greens) and some may be delicacies (such as the larvae of Vespid wasps). Wild foods are gathered from a variety of landscapes, including agricultural and pastoral, by a wide range of people not restricted to hunter-gatherer communities. A study by Zareen Bharucha and Jules Pretty, researchers in sustainable agriculture at the University of Essex (published in the Philosophical Transactions of the Royal Society, August 2010), documented 90 to100 species in 22 countries in Africa and Asia.. Some of these foods can thrive in degraded environments. Over-exploitation does not have any obvious negative impact (such as weeds and rodent pests in an agricultural field), while some are sensitive to unregulated harvest. It is necessary to know how communities go about collecting wild foods: whether there are implicit regulations in their tradition; whether they recognise the space (degraded lands, forests, swidden fallows, rice fields, sacred groves) from which foods are gathered; whether there are any specific ways in which foods are processed or stored before consumption. 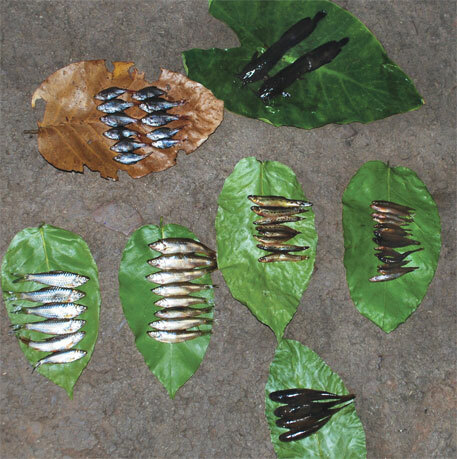 Two important factors in wild food foraging are the skills (when and how certain fish and frogs are collected) and the tools required to procure the food (traps and specific fibres for ladders). People should also be able to identify food species correctly which is possible through a flow of knowledge between generations. Usually such circumstances exist when a community’s traditions with regard to forest use is more or less extant. 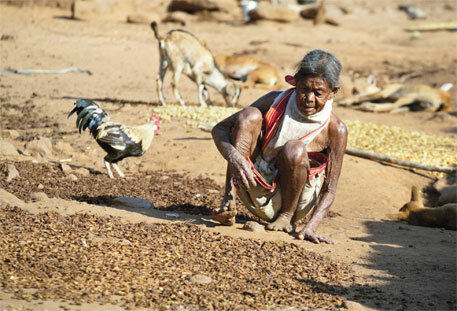 Though this situation is rarely encountered in the country today, there are communities across central India much of whose food comes from the wild (see “A fiery delicacy from the tribes of central India” on p50). When traditional knowledge is not passed down from one generation to the next, or when certain raw materials become scarce, the amount of wild food a community is able to gather and consume declines. This shows immediately in a society’s health, despite the supply of foodgrains in sufficient quantity. Incidences of anaemia, piles and diabetes across rural and tribal India are on the rise, indicating high levels of starch and lack of iron and roughage in their diets. Wild food collection is a strategy among all sections of people, whichever ecological, economic or social zone they inhabit; these foods are especially important for the poorest households. Agro-ecosystems that have been simplified by monocultures have had the greatest impact on the poor; as agricultural systems change, the pressure on wild food availability increases. 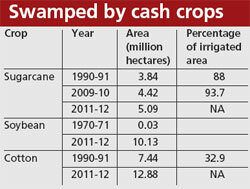 In many areas across rural India, especially in Odisha, Madhya Pradesh and Chhattisgarh, vast tracts are now under cash crops. As corn is lumped together with other coarse grains (sorghum, millet, barley), the increase in coarse grain production is due to the corn and not because of an increase in sorghum or millet production. According to the Global Agricultural Information Network, corn has shown “a steady upward trend due to continuous expansion in area under hybrids, currently estimated to be around 60 per cent”. The network states that millet and sorghum “are also facing competition from other crops such as cotton, soybean and pulses in several states” (see “Swamped by cash crops”). In Bolangir district in Odisha, people in villages at the foot of the Gandhamardhan Hills, famed for its forest and medicinal plants, seldom went to dig yam earlier. But in one house, they had not eaten yams in four years. There are few fish in the streams due to the run-off of pesticides used to grown cotton. A similar situation prevails in adjacent Bastar region in Chhattisgarh, where the predominant crop is corn. In some countries, the response to such change has been to domesticate some wild food species in house gardens or degraded lands near villages. Wild foods, often found in agricultural or forest landscapes, represent a “hidden” or “free” complement to whatever crops are cultivated. These hidden foods fill in the gaps in micronutrients, especially zinc, iron and various vitamins that are often missing or found in insufficient quantities in the staple foods of people. After the Green Revolution, which increased cereal crops in quantities large enough to have surpluses, there was also a simultaneous loss in diet diversity. Cereal-based diets were lower in zinc; there were shifts to higher pH soils; phosphorous-based fertilisers decreased zinc uptake and nitrogen-based fertilisers reduced the translocation of this essential metal from leaves to seeds. The Green Revolution has also affected biodiversity as it focussed on finding high-yield varieties of only a few crops, essentially rice and wheat. As a result, there have been no productivity-enhancing technology as far as coarse grains are concerned. The response to emergencies, such as famines, has been to cut down on agricultural and biological diversity. Much of the mainstream research on agriculture as well as forestry still concentrates on cereal crops, timber or medicine; little attention is given to the bulk of plant and animal products harvested for food from lands and forests inhabited by indigenous communities. An important but overlooked aspect of wild foods is their documentation as “indicators”, their ability to point to changes in microclimates, in the ecosystem, of water-tables, or of the availability of honey from a particular forest. In central India, a preliminary survey by this author noted about 400 species of plants and animals used as food. The threats to wild foods are many. There are issues like loss of forest cover, mining and the expansion of hybrid crops; there are also less obvious reasons such as migration among the rural youth, depletion of resources like bamboo, protected areas where people are denied access, the distribution of subsidised foodgrains and the uncritical popularisation of fast foods. These are all direct threats to people’s food security, none of which are even remotely hinted at in the National Food Security Act. We are told that political parties moved more than 200 amendments to the Bill. How one wishes that such diversity is reflected in the freely available wild foods rather than in politically coloured opinions about the food Bill. Red ant (kenil) belongs to the genus Crematogaster. These ants make small nests in the leaves of trees, especially on sal trees. Their eggs and larvae are fatty. The ants are found in most parts of tropical Asia. They are high in ascorbic acid and have a sour and pungent taste. 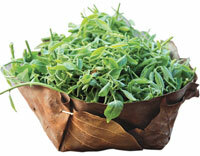 They are recommended for common cold or to boost Vitamin C in the body. But you cannot get your hand at a nest of red ants without getting painful bites. Many greens and vegetables–—jackfruit, pumpkin, drumstick, various Amaranthus—are cooked lightly and mixed with a gravy of kenil and rice paste. The gravy is usually spiced with red chillies and tamarind, and the kenil gives a unique flavour. 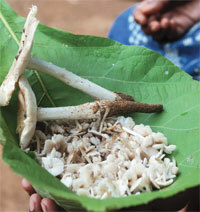 Such a side dish to rice is known as nuka-raba in Durwa, Bastar, and as amat-sag in most other parts of the district. Beska refers to the plant as well as the rhizome of Costus speciosus, a herb of the ginger family that grows after the first showers of the monsoon in many parts of tropical Asia. Leaves are spirally arranged on the stem and the white flowers have a bright red calyx. The rhizomes are slightly stringy and less strong than ginger—which is why it is possible to eat it raw in large quantities —and is a popular ingredient to many types of chutney. A common preparation is the beska-kenil chutney, an excellent accompaniment to rice-beer and an efficient counter to hangovers. Remove the larger, mature ants and the dirt common to most nests. For this, shake well in a basket. While doing this, the larger ants move away from the eggs and larvae on their own. Wash and skin the beska, and cut into small pieces. Cut chillies, onion and tomato and add to the tamarind pulp. Mix all the ingredients and pound lightly together. The end result should not be a paste. Allow each ingredient to stand out individually. Serve in leaf cups. Food sourced from the wild are not just important for the food and nutritional needs of the people but it also plays a major role in the cultural ethos of communities. You have rightly highlighted where there are problems/threats but one thing is clear- in many instances the youth are not keen to be seen consuming food collected from the wild- there are many reasons including all those you have pointed out, but when none (the majority/mainstream??) of us value such food or the traditional knowledge, why would the young want to do? Landuse changes, restrictions, monocropping etc., will definitely affect the wild food but once such knowledge is lost from a community's memory,we would be losing something precious including the chatpata receipe you have given! Good article. We would like to focus on the issues related to indigenous Food habits and procurement/collection/harvesting/conserving practices of communities living in Eastern Ghats. This article gave us an understating about process of approach. A brilliant article on forest dependence and differential food habits. Such stories are important in documenting the diet diversity and social dynamics of food and forestry. A commendable piece by Madhu Ramnath.